Logan Forsythe is, apparently, a late bloomer, but are his stats a fluke or are they legit? From 2011 to 2013, Forsythe only played in 62, 91 and 75 games respectively, so we’re going to (sort of) discount those seasons. Plus, those seasons were in San Diego, and we’re more concerned with his current situation of playing in Tampa Bay. In 2014, Forsythe managed to hit just .223 with 6 HR and 26 RBI in 110 games (301 AB). While we’re not excited about that batting average, we also recognize that he hit .273 in 91 games with the Padres in 2012. That’s a large enough cross-section of data to show us that his career-best .281 average last season is at least doable. While he may only crack .250 this year, the rest of his numbers should stay pretty even with last season. Logan Forsythe was a late bloomer, finally having a breakout season at the age of 28. *Age: 28 is late for a breakout season, but not a concern for too much of a drop in his stats in 2016. *B today's standards, 111 strikeouts in 153 games isn't too shabby. Should get on base plenty. *Almost exactly half the walks as strikeouts indicate he can only improve his stats so much. Should stay at this level until there's an improvement, here. *33 doubles indicates the (moderate) power isn't a fluke. 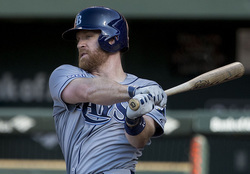 Looking at the Tampa Bay Rays’ lineup (Longoria, Steven Sousa, Logan Morrison, Kevin Kiermaier, Brad Miller and Hank Conger), there’s a decent amount of pop that can end up being contagious, which is kind of what happened to Forsythe last season. There was enough protection around him and enough guys on base to where Forsythe got a lot of good pitches to hit, hence the boost in production. Not to mention he finally got to play a full season. To bring this full-circle, expect another solid, full season out of Logan Forsythe. He won’t light up your fantasy league, but he will contribute significantly, especially for a second baseman. Also, keep an eye out for Nick Franklin (a potential backup). If Forsythe gets hurt or manages to go into a slump of epic proportions, Nick Fanklin could a very suitable backup if you need one… kind of like how Forsythe was last season for a lot of fantasy teams.